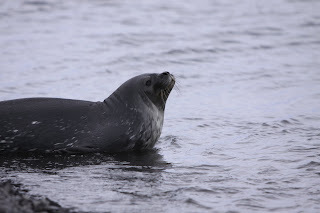 A Weddell seal at Hut Point. 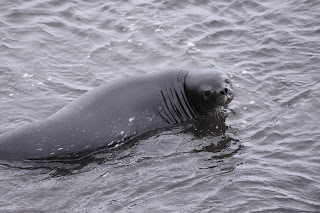 The Weddell seal keeps an eye on me walking the ridge above him. For some reason the department I worked in this year gives us two days off instead of one before we fly. That, combined with the fact I have so little stuff, meant that I was done packing well before I had to fly. On my next to last day, I took care of a few odds and ends, but mostly I was left for a lot of time for goodbyes to old friends and old places and just plain mucking around. 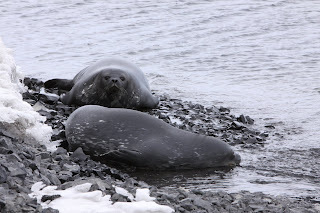 Weddell seals at Hut Point with Mt. Discovery in the distance. Some of that mucking about sent me down the Hut Point with Jade. It was both of our next to last days on the Ice and our final hike down to Hut Point. Unfortunately, it happened so long ago, I don't know what to write anymore. We had to take the roundabout way because the road was closed, but it was worth it because we were the only ones around. 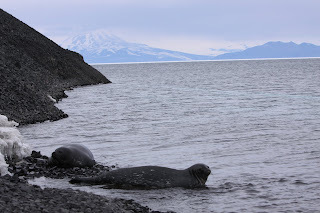 It is such a treat to able to experience those places we share with others so much as a small group, especially at McMurdo in the summer where we are always surrounded by so many people. 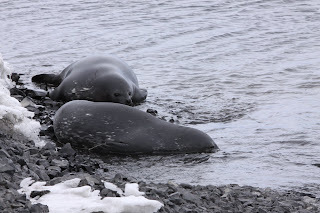 This particular visit yielded a couple Weddell seals playing, resting, and swimming. I don't think I have ever seen them spend so much time near the point that way before. 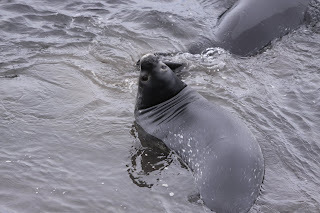 It was a pleasure to see them on one might end up being my last full day at McMurdo. I've applied to return, but am going to make a final decision later. It is a beautiful place that I'll always carry with me.